It doesn’t seem to matter who’s in office in the US -- Republican/Democrat, conservative/liberal -- there’s a war machine constantly running. My concern is that there's a building risk that one day that war machine is going to bust apart. And when it does, the long relative peace that the US and Europe have enjoyed (even as they’ve visited a lot of death and destruction elsewhere) will be shattered. How many of those are now ‘front and center' in your concerns? Probably none. Today's big ‘bogeyman’ is North Korea. Have you wondered why? The news about North Korea is at a fever pitch. Again, we have to ask, why now? Let’s see here…what could possibly go wrong? The South's trumpeting of progress on setting up the Terminal High-Altitude Area Defense system, or THAAD, comes as high-powered U.S. military assets converge on the Korean Peninsula and as a combative North Korea signals possible nuclear and missile testing. About 8,000 police officers were mobilized, and the main road leading up to the site in the country's southeast was blocked earlier Wednesday, Yonhap reported. About 200 residents and protesters rallied against THAAD in front of a local community center, some hurling plastic water bottles. North Korea conducted live-fire artillery drills on Tuesday, the 85th anniversary of the founding of its million-person strong Korean People's Army. On the same day, a U.S. guided-missile submarine docked in South Korea. And the USS Carl Vinson aircraft carrier is also headed toward the peninsula for a joint exercise with South Korea. The moves to set up THAAD within this year have angered not only North Korea, but also China, the country that the Trump administration hopes to work with to rid the North of nuclear weapons. China, which has grown increasingly frustrated with its ally Pyongyang, and Russia see the system's powerful radars as a security threat. I consider having to deploy 8,000 police officers to deter possible protestors as a strong sign of just how unpopular a move it is for the THAAD system to be installed. North Korea is rattling its sabers, the US is moving assets in, China is both alarmed and trying to be helpful at the same time, probably preferring to let a sleeping dog lie. This is an incredibly volatile moment, especially considering that Kim Jong Un has been anything but rational his entire life. So, again, we have to ask: Why now? Why has beating North Korea into submission become such a sudden national priority? Before address that, it bears repeating that most of what passes for “news” in the West is actually well-crafted talking points put out by self-interested people who have discovered a fantastic way to remain in power and accumulate wealth. Read more about this in our prior report: We Are Being Played. Well, that's true at least as long as we consent to follow along and dutifully remain ignorant of these tricks of persuasion by propaganda. There’s really no good excuse for being fooled, except mental laziness. The tricks of this trade are neither subtle nor difficult to spot. Meanwhile, the actual things that are deteriorating alarmingly are not even talked about -- ever -- in the main news outfits. Alarming species extinction rates, the loss of phytoplankton in the oceans, the loss of terrestrial soil fertility into oceanic dead zones, and the largest wealth gap in all of history created on purpose by central banks -- very real crises like this are nearly completely ignored. These are all very dangerous to our future, but they aren't talked about because doing so won't sell more weapons. Nor will it advance any political careers, or goose banking profits next quarter. Unverifiable “evidence,” anonymous sources, and the broad appeal of “many experts.” Sound familiar? It should, it’s the exact same playbook used by the war machine to bomb and invade Iraq, Afghanistan, Syria, and, someday soon, Iran and Russia. What I’m saying is that it’s the exact same trick used over and over again. Either the New York Times is the stupidest crew of reporters and editors ever with completely flat learning curves, or they are in on the racket. More likely the latter than the former, I'm convinced. The New York Times hasn't seen a war it couldn’t support (especially in the oil-rich Middle East). So the big question is ‘why now?’ Why is North Korea suddenly such a concern? They’ve been peskily doing what they do for a very long time; developing crude nuclear devices and lobbing test missiles into the sea. If you happen to be the ocean around North Korea, you have to absorb a wayward rocket now and then. But there’s not much of a threat beyond that at the moment. None of the articles I’ve read have given any credible insight into why North Korea is considered a clear and present danger to US interests at the moment. 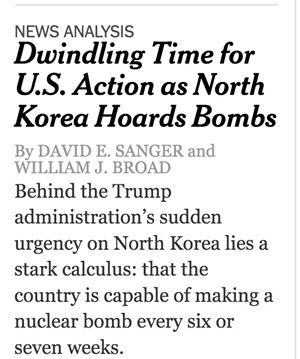 More than that, no analysis has been proffered to explain how any potential military action doesn’t just end in a bloodbath for the poor people of South and North Korea. When it comes to soldiers based on the North Korean border, the US only has about 20,000 troops permanently stationed in South Korea, as well as about 8000 air force personnel and other special forces. There were also about 50,000 military personnel based in Japan. Compare this to North Korea, which has 700,000 active soldiers, but a whopping 4.5 million reserves. Prof Blaxland said North Korea had also massed about 20,000 rockets and missiles on the border with South Korea, and when you are playing a numbers game, technology doesn’t always win. “There’s a saying ‘quantity has a quality all of its own’,” he said. As a reminder, Trump campaigned on a peace platform. So this sudden belligerence has to be coming form some heavy internal pressure; or he’s simply flip-flopped (or wasn’t honest) on a very important matter. Continuing with the mystery of Why now?, we note that the potential consequences of a kinectic conflict for South Korea are staggering. The simple fact is that, no matter how many jets and cruise missiles a carrier group launches, or what countermeasures South Korea and embedded US military bring to bear, there’s little chance of them wiping out anything but a very small percentage of North Korea’s conventional artillery and rocket capabilities. Trump, who clearly and unequivocally campaigned on a peace platform, is now sending a “very powerful armada” to the coast of the DPRK. Powerful as this armada might be, it can do absolutely nothing to prevent the DPRK artillery from smashing Seoul into smithereens. You think that I am exaggerating? Business Insider estimated in 2010 that it would take the DPRK 2 hours to completely obliterate Seoul. Why? Because the DPRK has enough artillery pieces to fire 500,000 rounds of artillery on Seoul in the first hour of a conflict, that’s why. Here we are talking about old fashioned, conventional, artillery pieces. Wikipedia says that the DPRK has 8,600 artillery pieces and 4,800 multiple rocket launcher systems. Two days ago a Russian expert said that the real figure was just under 20,000 artillery pieces. Whatever the exact figure, suffice to say that it is “a lot”. The DPRK also has some more modern but equally dangerous capabilities. Of special importance here are the roughly 200’000 North Korean special forces. Oh sure, these 200,000 are not US Green Beret or Russian Spetsnaz, but they are adequate for their task: to operate deep behind enemy lies and create chaos and destroy key objectives. You tell me – what can the USS Carl Vinson carrier strike group deploy against these well hidden and dispersed 10’000+ artillery pieces and 200,000 special forces? Exactly, nothing at all. Clearly that’s a very unsettling prospect for South Korea. Just imagine a favorite major city of yours with a completely unstable leader within artillery range just to its immediate north. It’s a frightening prospect. Again, I cannot find a single credible reason for Why now?. And so, we have to simply speculate. Possible reasons range from an itchy military industrial complex that is disappointed that it cannot seem to goad the US into war with Russia and North Korea just happened to be next on the list, to the idea that Trump is really seeking trade deal concessions from South Korea and is using the North Korean situation as leverage. The latter is not out of the realm of the possible, with Trump having said he wants South Korea to pay for the THAAD system being installed and that he wants to renegotiate our balance of trade with them, too. Who says stuff like that at a time when war might break out? Someone who doesn’t really appreciate the gravity of the situation, I'd suggest. I mean, if it’s a negotiating tactic, it’s one that could end up with a lot of people losing their lives and a ruined economy. If it’s a negotiating tactic stapled to a crisis, it’s still an odd thing. Tensions with North Korea are about as tight as can be right now. And the wild card is the apparent instability of Kin Jong Un. Who knows what he might do? Any equally-perplexing mystery, which for now I'll have to file under “central banks control the markets” is why the KOSPI (South Korea's stock index) is up so much on the outbreak of these very serious tensions? Either the central banks are propping it up here to keep the masses calm, or the central banks are to blame for pouring so much liquidity into world markets that even the risk of obliteration is insufficient cause for a stock market to go down. So take your pick: either it’s a controlled market or it’s a sign of just how outrageous the bubble mentality across the world has become. One feature of bubbles is the inability to entertain the idea of an asset ever going down in price. So they go up; news and data be damned. 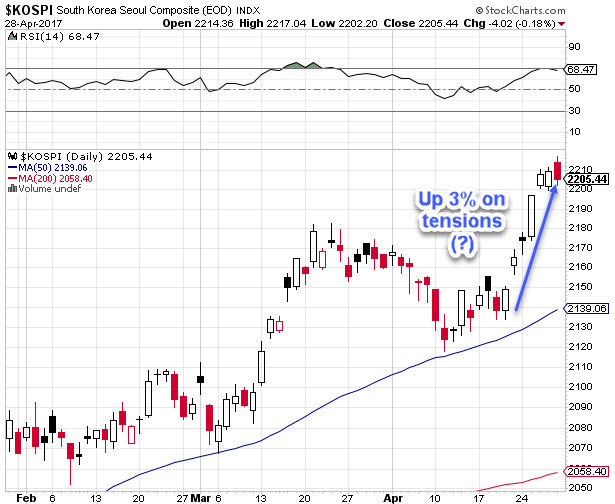 I just find it extremely strange that the South Korean stock index is powering higher through all of these tensions. It's very, very strange. Stocks are not supposed to like uncertainty. The post-French election stock buying spree was explained on that very basis: the French elections removed uncertainty and therefore stocks went up. But now we're being forced to accept how stocks are going up as uncertainty increases. Since it really makes no sense, other ‘reasons’ are being given. But it’s just too strange for the rational mind to believe them. It’s just not normal; and therefore we don’t live in a normal world anymore. If a full shooting war breaks out with North Korea, there will be massive casualties on all sides. To think that peace depends on Trump negotiating with Kim Jong Un is a particularly comic-book-worthy plot line. It seems absurd. But here we are. If you live in Seoul, you should consider getting out for a while. Take a vacation, or work remotely, and bring your family. Just for a while -- maybe a couple of weeks. If you can’t do that, then be sure all of your loved ones know the rally points and basement shelters that apply. Review your basic contingency plans and then hope that they won't be required. Remember, any outbreak of war is going to be a very bad thing for the globe at this particular moment in history. Debt levels are stretched to the limit, GDP is weak, and it won’t take much to upset the economic and financial market apple carts. For everyone else, read our report How To Prepare For War that was prepared for the possibility of a war with Russia. It’s not a pleasant topic, nor one I like to keep raising. But there’s a crew in charge in DC that is intent on starting wars, and they are not about to stop now. I believe they span administrations and they are very influential. I also happen to believe that they will eventually pick a fight we all regret very much. I think that North Korea only has atomic bombs and not nuclear bombs,do you remember the proof of concept the hydrogene bomb the USA held the late 1940"s.The North Korea government used the same type of test for there bombs. Props for the Justin Raimondo tweet! He's always worth a read at antiwar.com which covers the geo-political stuff our MSM doesn't want us noticing. I think that the powers that be worked up a detailed psychological profile of Trump during the campaign. They now know what buttons to push to get whatever they want. Keeping him isolated behind the neocon cult certainly helps. Does anyone remember those "small hands" comments in various "news" outlets. I guess he doesn't want to look insignificant downstairs. I have a bigger ICBM than you. During WWII, US conventional bombing in Japan dwarfed the two famous Manhatten Project bombs, largely destroying 67 cities, including Tokyo and killing 500,000 Japanese. Yet, the two bombs get all the attention. The most recent numbers I ran, either 2015, or 2016, had the US dropping an average of one bomb every three minutes 24/7. Yet we are talking about going to war with another small country because they might use a bomb in the future?! There is definitely something wrong with this picture. 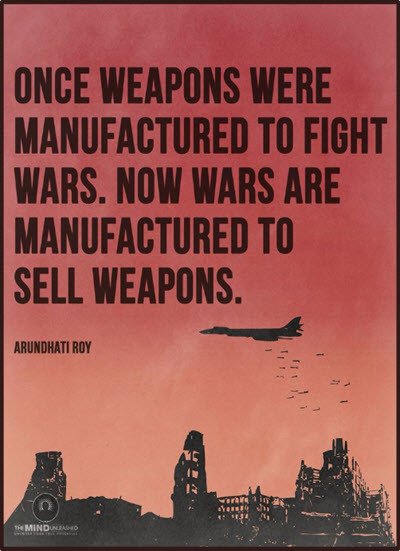 Perhaps, to grow the US economy, we have to grow the manufacture and consumption of bombs? The most recent UN security council meeting was, in a word, a disaster. Sharp divisions are now apparent between the US, which wants “action” and China which wants continued negotiations. Russia also does not want to see the outbreak of overt hostilities. So we’ve got the US demanding urgent, immediate action and everyone else seeking diplomacy. Oddly, the South Korean position and desires do not appear anywhere in any of these main articles. It’s like they don’t even exist. No quotes from the current leadership, nothing about how the people of South Korea feel or what they want. Just chirping crickets from the press. Like I said, that’s pretty odd all on its own. I think it tells us that getting the South Korean reaction and human side of the story would mess up someone’s plans. If you are planning a war, it’s best to keep everything tilted as far away from the human element and towards the evil/demon side. U.S. Secretary of State Rex Tillerson warned on Friday that failure to curb North Korea's nuclear and ballistic missile programs could lead to 'catastrophic consequences,' while China and Russia rebuked Washington's threat of military force. The showdown in a meeting of the U.N. Security Council on North Korea highlighted the diplomatic challenges of resolving tensions over Pyongyang, with the Trump administration aggressively pressing Beijing to rein in its ally, and China and Russia pushing back against Washington's rhetoric. I can only imagine how China is receiving this headache and US belligerence internally. There have been plenty of signs in the past that they have not exactly been pleased with being told, like a child, what to do by the US. That really caught my eye at the time, and I wrote about it because it says, effectively, that China feels that it deserves to be treated as an equal and is tired of being lectured to and scolded into shape by the US. That was not just a minor snub, it was a full blown face-loss-ripping sessions. Further, it is not lost on the Chinese, who apparently can remember things for more than a few days, that the US really has no moral position to be talking to anybody about bargaining in good faith (see also NATO expansion towards Russia, lying about weapons of mass destruction, etc.). The point here being that China may already have a view that the US was not exactly entirely trustworthy prior to Trump and now may feel that an added element of unpredictability has been added to an already strained mix. [Tillerson] urged the council to act before North Korea does and called on states to sever diplomatic and financial ties with Pyongyang and suspend the flow of North Korean guest workers, as well as impose bans on North Korean imports, especially coal. "Failing to act now on the most pressing security issue in the world may bring catastrophic consequences," he said. Ah. So after lecturing China on what to do, they’ve finally decided that the key talking point is the threat of a nuclear bomb…a mushroom cloud that will appear over Seoul or Tokyo or Seattle. Got it. Now where have I heard that before? Condoleezza Rice then said something that was ominous and made headlines around the world. Well, it worked once before, so why not now, eh? The big difference between the Iraq and North Korea situations is that Iraq had no nuclear program capable of producing a bomb and NK already has bombs. But the logic now escapes me. If we know that NK already has the bomb, and we know that NK is led by a very bellicose and unstable leader, how does threatening NK accomplish anything besides create a very dangerous situation for South Korea? Wang said dialogue and negotiations were the "only way out." "The use of force does not solve differences and will only lead to bigger disasters," he said. Given a choice between talking and threatening, China figures talking is the better way. The US is pretty clear on the matter – bombing is the better way. Russian Deputy Foreign Minister Gennady Gatilov cautioned on Friday that the use of force would be "completely unacceptable." "The combative rhetoric coupled with reckless muscle-flexing has led to a situation where the whole world seriously is now wondering whether there's going to be a war or not," he told the council. "One ill thought-out or misinterpreted step could lead to the most frightening and lamentable consequences." That last part I bold is how I feel about the situation. Once again I find myself resonating more strongly with the statements of foreign leaders than the US political leadership. I have the feeling that there’s an entirely out of control structure in DC that seized the reigns a long time ago. They are unelected officials, working their neocon magic behind the scenes to create constant conflict which only ever serves to empower and enrich the same craven class of people. And the US news media is beholden to the same cast of characters somehow. The US is in a very bad way and will not be able to correct its path until or unless a disaster strikes as a result of its overly muscular responses to, well, … everything and everyone. We desperately need a new course for humanity. One that understands that we are at a critical point in human development. It’s a time to grow into who we really can be in this world. We need more love, compassion, understanding, cooperation, listening, and understanding. With each other and with all species. Though I'm sure the deep state uses the psychological methods you mention to manipulate the President, whoever it may be, there's lots of evidence that their real power of the deep state lies in bribery and blackmail augmented by selective assassination. Sibel Edmonds has first hand knowledge of the blackmail operation by Bill Clinton against Congress during the impeachment proceedings. She has written extensively about it but the summary is that the FBI was used to obtain blackmail material on multiple Senators and Congressmen. It was made clear to them that should they not support Clinton they would be outed. Recall that three Congressmen resigned in scandal the week before the impeachment vote. You can find an overview of it here https://www.newsbud.com/2015/09/20/dennis-hastert-case-clinton-scandals-fbi-the-1996-cointelpro-directive/ Some of her other articles have examined it in more detail. Each year, in April or May, the google trends chart on search frequency for the term "cold war" spikes hard, and then recedes. Its now April, heading towards May. We are now experiencing our "cold war spike." A friend of mine suggested it was related to (high school) curriculum, and the subject "cold war" comes up right around this same time every year because that's where it is in the book. But its interesting we have a geopolitical war-type event right at the peak. Or - maybe we have this sort of event so often, this is just a fortunate coincidence. With 20,000 artillery pcs and a very large stockpile of poison gas N Korea could seriously harm the millions in S Korea. And, these 'dud' missiles may be a fake punch to reduce preparation by Japan or some other in range neighbor. A conventional bomb on the remnants of the Fukushima facilities would be a nuclear disaster without an atomic bomb. I'm with the Chinese and Russians for negotiations. ...a fishing trawler carrying a NorK bomb into a harbor on the West Coast is what's more likely, IMO. Doesn't even have to be a fissionable bomb (although that would give the most effective terror factor), just a dirty one that renders some large percent of a major city unusuable. You say our intelligence services could track such a boat/sense the bomb -- stop the boat from getting to the USA? I reckon they probably can. If they want to. You think they do? Are we thinking they're trying to *prevent* a war? There are way cheaper, more reliable delivery platforms out there than a long range ballistic missile delivery. Here's the Russian "Club K", IIRC this delivery system approach was part of plot in "One Second After" by William Forstchen. The container approach was also used for delivering a swarm of hypersonic antiship missiles in John Michael Greer's "Twilight Last Gleaming". Or just set off a nuke in the shipping container in a major shipping port. Edit: Given the power structure (the real one, not the garbage we get from the media), it would not surprise in the least if there were multiples of these (or something similar in approach) already present within the countries of the major power blocks. Their usefulness in a blackmail or "defensive first strike" situation would be temptingly hard to ignore. So, say certain elements of the US Deep State found out about NK's plan to detonate a bomb in a western US harbor as you suggest. That could be useful to know in advance. 1. Those in the know could double or triple their insurance coverage on properties in the targeted city so as to profit from the disaster. 2. Those in the know could short some stocks three days before the detonation to profit from certain companies' demise: Boeing in Seattle, Wells Fargo in SF, motion picture corporations in LA, etc. 3. Certain buildings could be pre-wired with high tech explosives to make sure they were obliterated even if the NK nuke kind of fizzled. Federal buildings containing troves of evidence in criminal investigations embarrassing for key players would get priority. 4. Several laws could be written in advance to take advantage of the public's fear which garner power and profit for certain elite players and the Deep State in general. I think you're on to something Sager. I'd be thrilled to be wrong. If I had to guess, I'd say the most likely primary motive behind the military escalation and media blitz/propaganda is not to take out NK in an actual war, but mostly to spur China to step in one way or another. The neocon contingent in the Deep State is probably hoping China uses their intelligence assets in NK to engineer/encourage a coup or assassination so a less troublesome leadership emerges (perhaps Kim's possible daughter as heir with a more compliant 'regent' wielding the power). The realpolitik contingent probably hopes China uses more economic and soft power leverage to weaken Kim Jong Un, stall or slow their nuke and missile programs, and gain leverage in the negotiations to follow. Trump is (or wants to be) a strongman, and threatening a showdown with NK appeals to that image. It also seems to please much of his keys to power, and I can see how he might attempt to turn this into a negotiation play a little down the road. All see a potential gain from this series of actions... so therefore, here we are! And while I don't think the following are the primary motives, I would guess the boost (both material and public support) that this gives the defense industry and the IC (Intelligence Community) does influence, though probably not outright control, the decision. The South Korean position is probably complicated. From what I was told by people who served over there, their military leadership tends to be aggressive and in some cases are itching for a chance to end the North Korea problem once and for all. From articles and papers I've read in recent years, the citizens and politicians seem to be of mixed opinions on aggressive posture to North Korea. So perhaps South Korea doesn't have a clear consensus or position, thus the U.S. leadership (possibly with discreet support from South Korea's military and select civilian leadership) gets to make their play. As for 8000 police showing up to deter protesters, that may either be an intimidation move to discourage dissent on this issue, or more of a basic reflex as per South Korea's typical history of protests and heavy-handed crackdowns. Honestly I have mixed feelings on this development. On one hand, I detest the media and gov't trying to manipulate us (which they are clearly trying to do), think the propaganda blitz is not helping matters, and think the motives of those in charge are their own and don't have our interests in mind. But on the other hand, unlike Syria or Iraq or Libya, I do see North Korea is a legitimate threat to the U.S., even if not an existential one (yet) as is commonly portrayed. I interpret many of their moves as being consistent with attempting to develop EMP weapons for use against the U.S. and possibly Japan, and while they likely wouldn't attack out of the blue, I do think they're waiting for the right time and a critical moment of weakness (whatever that might be). Now IMO that's still not worthy of a pre-emptive strike, but it does merit some move to counter the threat. North Korea shows no favorable response or trustworthiness when it comes to most diplomatic overtures, so we can't depend on that. So in a way I can see how a measured display of military power might be appropriate, and I don't have much issue with having a U.S. carrier fleet and nuclear sub presence in the region for a time... provided it's not accompanied by exercises, behavior, or excessively close proximity that could be too easily misinterpreted. The THAAD system... eh, that's much more iffy since that would be more or less a permanent action, one that could adversely affect long-term diplomatic relations beyond the Korean Peninsula. I'm not greatly worried that this will turn into a shooting war (at least this time). Kim Jong Un is probably more worried about internal threats removing him (and legitimately so) than the U.S. or South Korea. But one of the things I'm watching for is if the U.S. attempts to shoot any of North Korea's missile tests aimed at the ocean. If that happens, that hints to me that the ones running things DO have a desire for a larger war, or at least are way overconfident and have wildly skewed assumptions as to the risks involved. I agree with everything you say except the "irrationality " of Kim Jong Un. When you look at how the USA has treated countries that refused to toe the US line such as Libya and Syria Kim Jong Un is doing the only rational thing and retaining his nuclear threat. Fortunately the truly rational world powers, China and Russia, have called for an end to the US/South Korea war games , simulating an invasion of the North and in return they will bring North Korea to heel. These war games apparently occur at the time of the rice harvest .North Korea's need to man the palisades as well as well as bring in the harvest are put into dilemma. Good one USA. Striving for a peaceful humanitarian world once again. "Trade wars, currency wars, world wars. When all else fails they take you to War !" And Howard Kuntsler nailed Kim Jong Un perfectly when said he's the world's real life Batman Villian. All this is just a little too much to take. The "USA" is acting strangely? You say! Stock "markets" misbehaving, trade arrangements mixing and intermingling with vulgar war drumming. "News" outlets doubling down on their views. Trump positions on the trapeze. This all smells to much like a psychotic episode is nearby. When Russia didn't respond to the fight invite, well someone had to fill that void. Irrationality to follow. I recommend having your contingency plans having contingency plans. Sure seems like TPTB really want us all to focus on North Korea. Feels like a distraction. Look hear at left hand while covering the right. What else is going on in the world right now? And the difference between a nuclear and an atomic bomb is?? The atom bomb is a nuclear weapon that uses nuclear fission as its source of energy. N. Korea - We're "Late...."
The war games have been going on sense 1979 or later when I was in South Korea. Slapping a cobalt jacket on the thing is just mean. There is an ongoing grownup strategic conversation that came out of “Game Theory”, this is about a point in time in space when both China and Russia see the inevitability of a US attack and to position nuclear their submarines off each US coast, and let fly a decapitation missile strike that destroys 95 % of the US within two minutes. The Council of Foreign Relations, John McCain and Lindsey Grahams of the world with deep state support are bringing us near this decapitation trigger threshold. We won’t see it coming and the country side will be a nuclear wasteland for 500 years or more. This event can be averted but only if enough of the mutton minds in our midst wake up. Vegas odds are not very good. I vividly remember the Cuban Missile Crisis even though I was not yet nine years old. Perhaps this is because my father was a young civilian scientist for the Defense Department and he knew the missiles could reach Boston. He understood what damage they could inflict. I recall him being uncharacteristically nervous and cranky during the whole event. Next I was lying in bed in a cold sweat with my heart pounding and my adrenaline level at maximum. Needless to say, I did not go back to sleep. We are traveling in perilous times. Is there a "winner" here? Aloha, Steve. Anyone who imagines that any game-theory-driven Russia/China sub-based decapitation strike would actually "succeed" from a strategic standpoint doesn't understand math, the current US force structure, or its capabilities. 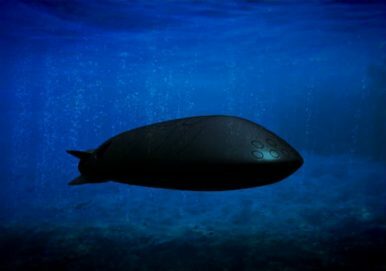 Sure, Trump and DC would be gone, but the ~10 Ohio class subs on active patrol would make short work of both attackers. If just 15% of the surviving missiles were launched (on two submarines), the "winner" of this game-theory exercise would be at the receiving end of (about) 300 thermonuclear warheads. 300 warheads are enough to target every city in Russia that has over 50,000 people. While KJU may or may not be a rational actor, Putin and Xi most definitely are. There are lots of things I worry about. This scenario isn't one of them. Here's some crazy-talk speculation. Anyone notice how every one of KJU's recent missile tests have failed? As if the missiles themselves are defective. Some people think its about hacking. What if its something else - a boost-phase anti-missile capability that has not been advertised by the US. Say a ship-based high energy weapon that needs 5-10 seconds to punch through the skin of a missile during its boost phase. Or maybe a drone-based anti-missile laser that loiters over the launch site and nails the missile immediately after launch. I don't buy the "failed missile" thing. And that would make the THAAD deployment just a cover story. Along with the hacking, it has all been a setup to encourage KJU to chase his tail looking for zero-day bugs, traitors and incompetence. I also agree the highest confidence delivery system is a bomb on a cargo ship in the target's harbor. Its not fast, but its a sure thing, and no ABM system will be able to knock it down. I also don't believe the launches failed. It could be that NK is blowing them up on purpose. Launch them to save face, so to speak, but destroy them while they're in NK space so as not to risk technically threatening someone. Makes me think of a line from The Rock: "Great, we're not gutless, we're incompetent." Anyway, that's one of the many possibilities, I suppose. Us using nextgen weopons are another, as Dave mentioned above. I believe the THAAD is stationed about 125 miles away from Seoul. I also believe the range of the THAAD system is 125 miles. Someone please correct me if I'm wrong. However, if I am correct, it would seem that THAAD is more of a dog and pony, in it's current configuration over there. Could just be frickin laser beams. The old ABL was Boeing 747 with a human crew and tanks of toxic chemicals to generate power. The new idea a high-altitude, long-endurance drone armed with a more compact electrically powered laser. But the technical and tactical challenge remains the same: building a laser-armed aircraft that can shoot down ballistic missiles at their most vulnerable, just after launch, without having to fly so close it gets shot down itself. “The problem with boost phase is…you’ve got to get close enough,” Frank Kendall, the Pentagon’s procurement chief, told reporters at the Space & Missile Defense conference here. By closing in, he said, “you get a softer target: The booster, the rocket itself, is a lot softer than the reentry vehicles.” But if you’re close enough to shoot at a rocket right after it launches from enemy territory, you’re probably close enough for the enemy to shoot you. Not odd at all. In fact, the "western powers" have a game they frequently like to play where they make Big Decisions and hold Big Conferences that determine the fate of other people, their land, and their resources without bothering to consult or invite the people themselves. Think Berlin Conference, the British and French Mandate system outlined by Britain and France at the Versailles Treaty conference (coincidence, I'm sure), the Munich Conference, or any number of other examples. Anyone who knows the history of western imperialism knows that a good half of the world's boundaries and borders make no sense precisely because they were drawn up at a table by some old European dudes in Paris, London, Berlin, Washington D.C., etc. There isn't, never was, and never should have been an Iraq, for instance. It's, like, what we do: debate and discuss what to do with your stuff or your room without inviting you to the discussion. I have no verification of this so who knows if it is true. But the MSM initially reported the missile blew up shortly after take off. I have read the missile actually flew for fifteen minutes and attained an altitude of 44 miles. If this is true, it reasons to me that either NK self destructed it or something knocked it out. Either way it is quite a bit different from the narrative we are told. "It is about the same thing that the demonization of Iran was about. The “Iranian threat” was an orchestration that was used as cover to put US anti-ballistic missile bases on Russia’s borders. An anti-ballistic missile (ABM) is intended to intercept and destroy nuclear-armed ICBMs (intercontinental ballistic missiles) and prevent them from reaching their targets. Washington claimed that the anti-ABM bases were not directed at Russia, but were for the protection of Europe against Iran’s nuclear ICBMs. Insouciant Americans might have believed this, but the Russians surely did not as Iran has neither ICBMs nor nuclear weapons. The Russian government has made it clear that Russia understands the US bases are directed at preventing a Russian retaliation against a Washington first strike. The Chinese government also is not stupid. The Chinese leadership understands that the reason for the North Korean “crisis” is to provide cover for Washington to put anti-ballistic missile sites near China’s border. China has been more forceful in its reply to Washington’s efforts than have the Russians. China has demanded an immediate halt to the US deployment of missiles in South Korea." Seems to me (in my limited understanding) that this is because China does not have as serious a "boomer" sub fleet as the Russians. If you have enough boomers out there deployed 20 miles offshore of your target, you don't need to worry about your land-based ICBMs getting through (in terms of deterrent). BMD is a complicated topic. Attempts to simplify it will end up losing vital bits of information. I think PCR has simplified things to the point where what he says is wrong. So the basic physics of the system tells us that US terminal-phase (THAAD) interceptors deployed to Korea (with an interception range of 120 miles) are no threat to intercept Chinese missiles - which are substantially farther away - unless those Chinese missiles happen to be targeted at South Korea. The only US interceptors that can threaten Russia and China (by destabilizing MAD) are the US midcourse-phase interceptors (called GMD). But those are not the missiles being deployed overseas. The US has exactly 36 midcourse-phase interceptor missiles, deployed in California and Alaska. The overseas deployments are all "point defense" interceptors, good only to protect the nearby cities. THAAD interceptor missiles deployed near Seoul can only intercept missiles that are targeting Seoul. Lastly, GMD has had a spotty record in testing. I'm not sure I'd put much faith in its ability to defeat a missile launch from a major power. THAAD looks to be quite a bit more capable, but it is also solving an easier problem, and as I mentioned, it only protects a few nearby target cities. Davefairtex gives a good description, and generally speaking I think he's correct. However, there are two 'gray areas' that are worth mentioning. First, while it's true only the GMD interceptors are capable (in theory) of directly protecting the U.S. from Russian and Chinese ICBM's (ICBM's being the ones that would be used against U.S. soil), the THAAD system CAN provide some protection for U.S. allies, U.S. bases and posts overseas, and certain U.S. pacific territories (Guam?). That may not mean much for protection of the 50 U.S. States, but it does matter in terms of overall military balance. Second (and perhaps this is what concerns China more), the THAAD system's radar is designed to interoperate with other missile defense systems like Aegis and Patriot (https://en.wikipedia.org/wiki/Terminal_High_Altitude_Area_Defense#Produc...). Even if THAAD can't shoot down Chinese missiles, it could potentially still use its radar to track them and pass that information to other missile defense systems that CAN engage them. So as much as I dislike the Chinese gov't and their own ulterior motives, I admit they do have SOME legitimate concerns about THAAD upsetting the balance of MAD. That all being said, I fully agree that PCR is oversimplifying missile defense, and in some cases gets things outright wrong. For example, he says "An anti-ballistic missile (ABM) is intended to intercept and destroy nuclear-armed ICBMs (intercontinental ballistic missiles) and prevent them from reaching their targets"... despite the fact that not all ballistic missiles are ICBM-range missiles (as Davefairtex alluded to, THAAD is in fact meant for intermediate and shorter-range ballistic missiles and only in the terminal phase of flight). And from what I take from other writings of his I've read, PCR seems to put every event & political move into the context of "TPTB/elites' diabolical master plan". Yeah.... sometimes there IS a sinister motive, but a lot of the time it's just a blend of arrogance, selfishness, realpolitik considerations, or plain old reactionary knee-jerk responses. For him to say THAAD has nothing to do with North Korea is even more shortsighted than those who say THAAD is ONLY about North Korea. In my view, the THAAD move is in the short and medium term about NK. Longer term I suspect it's much more about steadily increasing the general U.S. presence closer to a potential future adversary than any specific pre-emptive nuclear strike plan. Unless the leadership has been getting a wildly over-optimistic summary of their missile defense capabilities, they HAVE to know U.S. missile defense wouldn't amount to much versus China and Russia. Generally I view PCR the same as I view George Friedman, Jim Rickards, and certain other 'experts' in geopolitics... there's useful information to be gained, but it takes effort to filter out the useful stuff from their personal biases or world views. So while I share PCR's view that the elites are too reckless and have too much power, I have to agree and say that I found this particular article of his to be useless. If we wanted to use the proven & capable THAAD systems to protect the continental US from attack, we'd have to deploy interceptors near every major city. And if the THAAD interceptors deployed near a given major city ran out because of too many attacking missiles, that's it for the city. Another city's THAAD interceptors wouldn't be able to help. That's why we haven't done this. It just costs too much. GMD interceptors have the promise to be far more economical. Every GMD interceptor can intercept long range missiles targeting anywhere in the entire continental US. But GMD's record in tests where a GMD interceptor is asked to actually intercept attacking warheads - the results are not great. So we've deployed 36 expensive, poorly-performing GMD interceptors, crossing our fingers that they might actually work if called upon to defend the continental US, and we've deployed the much more reliable THAAD, Patriot, and Aegis/SM3 interceptors to protect specific targets (like Seoul, probably Tokyo, Southern Europe, and other allied targets). But SK THAAD interceptors won't help protect US cities. That falls to the poorly-performing GMD interceptors, which (to my mind) are a very thin reed to rely on in a storm. We do not have THAAD (or SM2, or Patriot interceptors) protecting US cities, because its just too expensive to do so. So this hypothetical launch-detection radar data from the SK THAAD radar sending data to NORAD allowing...GMD interceptors to fly forth and meet them? I dunno. I'm not feeling any safer. On 30 April 2014, the Government Accountability Office issued a report stating that the system may not be operational any time soon because "its development was flawed". It says the GBI missile is "capable of intercepting a simple threat in a limited way". On 12 August 2015, Lt. General David L. Mann (commanding general USASMDC/ARSTRAT) characterized GMD as the nation's only ground-based defense against limited ICBM attacks. Maybe we have a secret space program that can execute a space-based midcourse defense using some sort of (laser?) energy weapon. I certainly hope so, because the GMD system we currently have is an expensive boondoggle that probably won't work if called upon. And maybe that's really the answer. CAF is right, the secret space program exists, and that's why the Chinese don't like the THAAD radar system on their doorstep, because it makes the (hypothetical) space-based midcourse defense (SMD) that much more effective. If such a thing exists, it means the US is probably already (mostly) invulnerable to a NK missile launch. Perhaps this hitherto-undeclared SMD system has been using recent NK missile launches as target practice. Wouldn't that be interesting? It might explain why we don't appear to be spending much effort on improving the lame performance of the GMD. I think even placing THAAD in major U.S. cities would still provide no protection from ICBM's, as I understand ICBM's are too fast at the terminal phase for it to intercept effectively (I can't find the source article I read that from... I'll add the link if/when I find it). Maybe they would help with shorter-range versions of sub launched ballistic missiles (SLBM's), but based off of publicly available information it seems China and Russia only field SLBM's in the ICBM-range category, so not much help there either. As for THAAD radars, they are X-band radars that are capable of finer resolution (https://en.wikipedia.org/wiki/Sea-based_X-band_Radar) so it's reasonable to assume they could help the layered missile defense system a great deal. Of course, as you hinted the system is only as effective as its weakest link, and better radar amounts to the "Square Root of Fu**-All" if the GMD interceptors aren't up to the task. And are they up to the task?... because of the limited number and nature of the tests nobody really knows for sure. Successful tests show that intercepts are possible, but with only a 53% success rate for those intercept tests (according to the GMD wikipedia page) and almost all of those under ideal and/or scripted conditions, the intercept success rate in the real world would probably be significantly lower still. This is one of several reasons why I find Paul Craig Roberts' assessment that this is all part of a specific pre-emptive nuclear strike plan against Russia and/or China to be baloney... the odds of intercept (not to mention the number of interceptors) are nowhere close enough to being in their favor to take that chance, even if some were psychopathic enough to want to do it. Here are two interesting links for those interested. The first is about THAAD and China's concerns about it, while the second is a Nightline clip about GMD and the Fort Greely GMD site (it's an older clip but it's still relevant to the current state of the technology). The articles I read suggested that THAAD hadn't been tested against ICBM-speed warheads - I'm not sure if that is because it can't intercept them because of some design constraint, or they don't think its likely it will work. But I'm willing to go with you - we can assume if it hasn't been tested, then it doesn't work. Hmm. I just had a thought. Perhaps THAAD could actually work against ICBMs, but DoD prefers not to test against them because if it actually worked, that would generate a whole lot of fuss. It thus can pretend its just for use against the slower, smaller missiles. But maybe I'm just paranoid. Here's an article on THAAD I found - specifically focused on the SK deployment. It includes radar coverages, SSPK numbers (oh look, a new acronym) and casualty estimates for a NK nuclear attack on Seoul. I also saw a discussion of the Aegis/SM3 as a much more serious component of BMD, both in the late boost phase and also in defending the continental US. The US has a large number of Aegis ships floating around. Three, properly positioned and alerted, might actually be able to provide full ABM coverage of the continental US against a limited strike, but only if armed with the next generation SM3 missile - which seems to have a whole lot more promise than the rushed-into-deployment GMD. Here's a copy of a nifty slide showing the engagement ranges of the various Aegis missile variants; note the arcs of the more-capable Block II-A SM3 missile, which is in the testing phase right now (1 of 1 successful intercepts). The II-A is scheduled for deployment to NATO. So maybe the Chinese do have something to worry about after all. Not today, perhaps, but later on if/when the SM3/IIA missile is deployed on all those Aegis cruisers that are floating all around the world acting as mobile BMD platforms. Say by 2020. Won't be the first warning they have given, but it summarizes the situation well. I'm going out for dinner this evening, but will also remember to enjoy it especially. We never know when this will go live, but knowing what is happening as it goes down is a pipe dream. Why does a mainstream journal put this out? Is it genuine? Comments. Most of it all of us would agree with. The Youtube channel where this video is found uses the name "The Economist" but the logo and other branding does not match that of the magazine you're probably thinking of. It's definitely an interesting video but I highly, highly doubt that it's from the magazine found at http://www.economist.com . Thanks for that link to the mostlymissiledefense.com site... even as someone with a good amount of knowledge in this field, there's some good bits of information there that were quite new to me. It's always interesting how much open source information there is out there on these topics... it's no wonder so many intelligence agencies have large amounts of staffing dedicated to open source collection. There certainly does seem to be a shift towards the Aegis systems these recent years, especially with the scrapping of GMD in Europe in favor of the Aegis Ashore installations there instead. Can't say I blame them. If we're already resigned to Congress throwing gobs of taxpayer money on missile defense, at least I'd rather get something more useful out of it and spend more on the more versatile Aegis platform (steadily expanding those capabilities as necessary), instead of GMD which IMO is somewhat of a boondoggle. Given the disparity in weaponry, in the future I see North Korea, Iran, or any other so-called 'rogue states' as much more likely to use any hypothetical nuclear weapons against their neighbors in regional struggles rather than firing nuclear-armed missiles at the U.S. And the idea of having enough interceptors to stop or severely blunt a Chinese or Russian ICBM nuclear attack within our lifetimes is probably a pipe dream, given the huge numbers involved and the relative ease of developing and using decoys. So I suspect more bang for the buck (no pun intended) would be obtained by focusing on defending against IRBM's and theater-range missiles that are most likely to be used in any future global conflict (yes I admit I remain optimistic that we will manage to avoid large-scale nuclear exchanges in the future, despite the idiotic 'poking the bear' actions our sociopathic leadership and media engages in). Another false flag on the way to garner support for war? Looks like a good time to stay out of Melbourne.